What Are the Hazards When Shipping Dangerous Cargo by Sea? Delivering dangerous goods can help companies in industries such as chemical manufacturing, pharma/med, oil & gas and military/defense. However, sea transportation does pose certain risks that could prevent the cargo from arriving intact. In a worst-case scenario, rough sea conditions could cause dangerous goods to explode, jeopardizing the safety of the crew members. It’s this exact scenario that makes an anti explosive container a necessity. Ocean-going vessels are vulnerable to the constantly changing weather conditions that are prevalent while at sea. Depending on the geographic location, hurricanes, typhoons and cyclones can occur at any time and can damage the vessel and cause the cargo to shift or wash overboard. Safety hazards can also be man-made in nature. Careless handling and loading or unloading can increase the risk of explosion, as can improper packaging. An all-too-common mistake is the failure to separate volatile materials from other goods that can catalyze a dangerous reaction. When shipping dangerous cargo in explosion-proof zones, it is imperative to choose anti explosive containers that are built to meet these challenges. Containers for explosion-proof zones feature specially designed internal and external components that are blast-resistant, which promotes greater safety during shipping. The focus is on ensuring that parts that come in direct contact with the cargo are built to resist explosions, which significantly reduces the risk. Increasingly stringent international regulations place greater demands on companies that ship dangerous goods overseas. The violation of these rules and laws could result in large fines that could hinder your ability to do business and have a negative impact on your bottom line. Appropriate containers are essential when shipping in explosion-proof zones for maintaining compliance and avoiding crippling financial and legal penalties. Explosion-proof reefer units can also provide substantial cost savings for your company. A blast could ruin an entire shipment, which means you will have to bear the expense of replacing it (although insurance could offset some of the cost in some cases). Even if you’re able to replace the cargo, it will arrive behind schedule at your customer’s dock. The inability to fulfill the shipment on schedule could cause your customer to seek another supplier, which could have devastating consequences for your business. It’s much less expensive to keep an existing customer than acquire a new one. Finally, using the right refrigerated containers in explosion-proof zones will help protect your company’s most valuable asset: your employees. You’ll have the peace of mind of knowing you’re doing everything possible to keep your shipping personnel safe, which is a benefit that cannot be measured in dollars and cents. 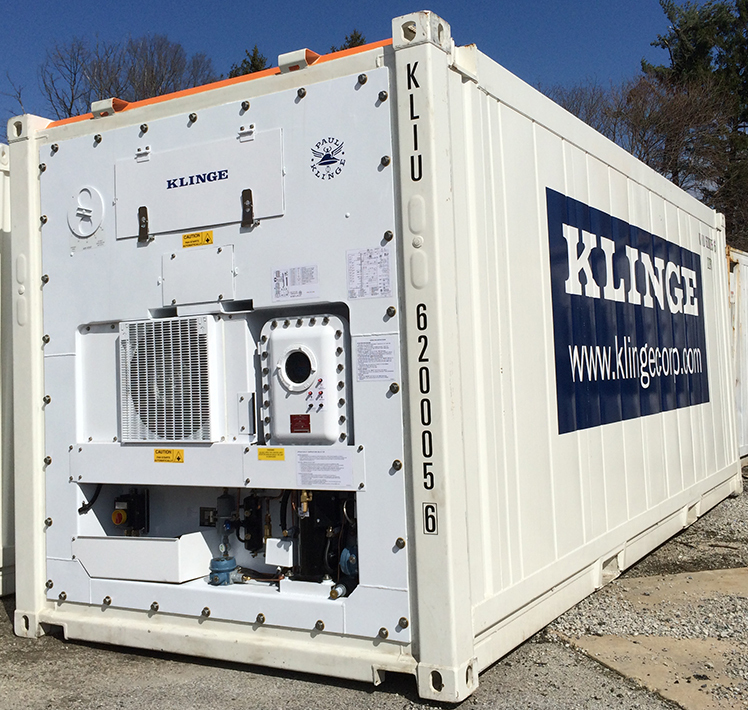 Klinge’s Explosion-Proof reefer unit complies with the ATEX Directive 2014/34/EU level of Group II, Category 3. Group II equipment is intended for use in places likely to become endangered by explosive atmospheres. Category 3 equipment is designed for areas in which explosive atmospheres are unlikely to occur. The PFR-571 Z2 is suitable for Zone 2 hazardous locations in accordance with EN 60079-10. The reefer unit, model PFR-571 Z2, was designed for 20ft and 40ft Insulated ISO Containers. Containers certified to DNV 2.7-1 are also available. The PFR-571 Z2 is used to store and transport goods in hazardous locations, such as those encountered in the offshore industry. It is also used to store and transport hazardous chemicals and other dangerous goods. Contact a Klinge Group Specialist Today! » The refrigeration unit design is compact, yet offers a large cargo area. » Every component in the evaporator section is explosion proof, since this section is in direct contact with the cargo area. » All external parts are explosion-proof. » Refrigeration system is just 14 in (365 mm) deep, allowing for maximum cargo space. » Defrosting of the evaporator coil is done with our unique and well proven “On Demand” hot-gas system, when required. » All components except evaporator coil are easily serviced from the front of the unit. » Easy access to all components in electric box. Door has lift off hinges. » Adjustable fresh air vent is labeled to indicate percentage of opening. » Bottom air discharge for better temperature distribution throughout load. » 50 Foot power cable with CEE 17 power plug is standard with cable storage box. » All electric, all-in-one cooling and heating unit. » The unit is designed to fit into the front of a container and to serve as the container front wall. Forklift pockets are provided for the installation and removal of the unit. Klinge Corporation offers more than 30 years of expertise in the manufacturing of safe, reliable refrigerated containers for a wide range of industries. Contact us to learn more about the numerous benefits our explosion-proof containers can provide for your company.